En Todo Marvel queremos ver a Malcom Reynolds compartiendo barra en un bar galáctico con Mapache Cohete. Spoilers, spoiles, spoilers… Aunque todo sin confirmar, claro. Pero lo dice Latino Review que no suele fallar en sus…¡ejem!… “Predicciones”. Según la web, la secuencia postcréditos de Guardianes de la Galaxia presentaría a Nova como personaje del Universo Cinematrográfico Marvel. Y el personaje estaría interpretado por… ¡Tachán, tachán!… ¡Natham Filliom! Apparently the after credits scene in this summer’s Guardians of the Galaxy will feature the human rocket, Nova. 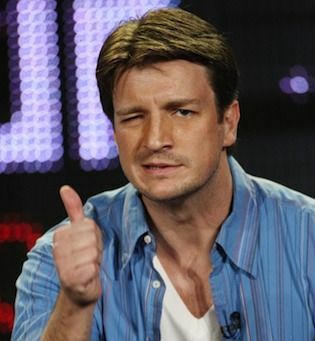 And as far as Dave Gonzalez can find out (he was unable to confirm), the character will be played by Firefly‘s Nathan Fillion! Which rendition of the character we will see was not specified, but going by his likeness to the comic book counterpart, it would be safe to make the assumption that Fillion will be playing Richard Rider. (ACTUALIZADO) Y finalmente el cameo de Nathan Fillion en Guardianes de la Galaxia podría ser… (¡spoilers!) El rodaje de Guardianes la Galaxia 2 empieza en febrero de 2016 James Gunn describe Guardianes de la Galaxia Michael Rooker como Yondu en Guardianes de la Galaxia SPOILERS – ¿Es esta la escena post-créditos de Vengadores: La Era de Ultrón? Como sea verdad me van a faltar manos para aplaudir en el cine. Espero que sea cierto, aunque tratándose de Latino Review mejor no nos hagamos ilusiones. Indeed, the smallest of seeds can and do grow into the greatest of trees.The pendulum, regardless of its massive weight is beginning to swing in the opposite disrotion.Thcee who perpetuated this crime are now caught up in the midst of a tsunami of culture. Many of those who cannot adapt will either be cast out or face demise.